Adar Reed is a WEC junior at UF. Taylor Soto is a senior at the University of Wisconsin — River Falls and a Field Biology major. We asked them about the research they are conducting in Gainesville this summer. What project are you guys working on? 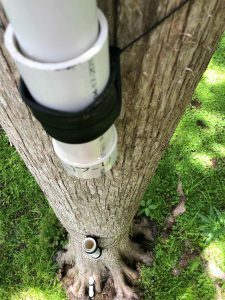 Adar: We’re working on a project to study tree frog microhabitat fidelity. 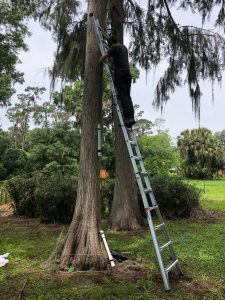 We’re setting up PVC pipes that are refuges, basically, but also traps for sampling, in three different intervals up trees, using a ladder, at UF’s Natural Area Teaching Laboratory (NATL) and Noonan’s Lake in east Gainesville. 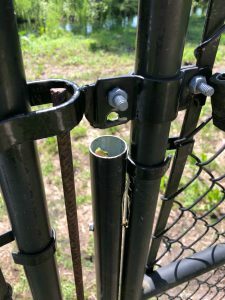 We’re going to be checking and moving the frogs to see if they come back to where we found them originally, or if they stay where we put them next. We’re trying to figure out if they have fidelity to their microhabitats. Are you guys moving them vertically? Adar: In the trees, there are three levels of pipes, so when we find them we move them up or down. Eventually, we also chose trees near each other, so if they do stick to the height, we could try moving them to the tree next to them. Will they move back to their original tree, or will they stay in the new one? 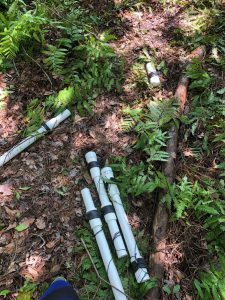 We are also setting up ground pipes, stuck in the ground around a breeding site, and checking horizontal distance. If we find them in one pipe, and move them to another, will they come back or stay there? Taylor, what brings you to Florida? Taylor: I’m doing the SURF engineering program, the REU. SURF stands for Summer for Undergraduate Research in Florida. There are about forty of us from across the US here in different departments, mainly engineers but there are a few people in the College of Agriculture and Life Sciences (CALS). Adar: I’m also doing this through CALS, and we’re both working with Professor Brett Scheffers in the WEC department. Adar, how did you get into wildlife? What’s your origin story? Adar: At first, when I was a kid, I always wanted to be a paleontologist and dig up dinosaur bones, but then I realized that animals were cool in general, and my parents always kept me in touch with nature, despite growing up in suburban areas. During vacations, we’d always go to national parks and go hiking. 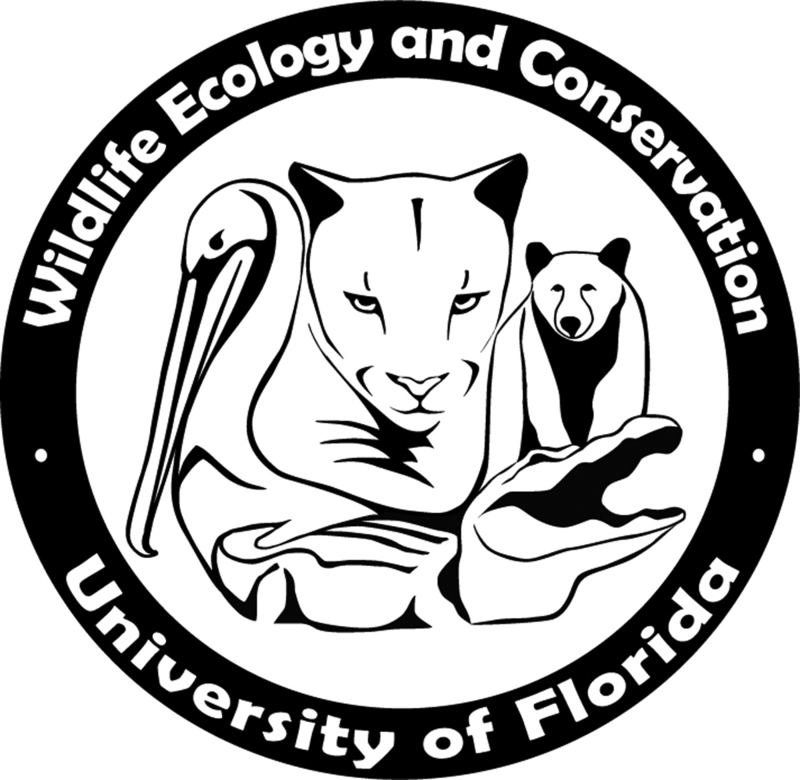 I was always interested in nature and animals, and then when I got to UF I realized this was a major and jumped right on it in orientation. Adar: I was born in Miami, but I lived in Israel for five years. Taylor: I was born in Orlando, and my mom always took me to SeaWorld, which sparked my interest in wildlife. Then, when we moved to Wisconsin, when I was really young, my grandma used to babysit me, and her house was in the woods, so as a kid I’d always spend my summers hanging out there with my cousins. My grandma would always teach me about wildlife and why it’s important. She’s always fueled my passion for it. Adar, did you go to a lot of national parks when you were in Israel too? What’s the wildlife like there? Adar: Not really, because Israel doesn’t have as much land for that. Pretty much everything is either city or farms. There are natural areas, and there is a growing movement for reintroducing animals that were chased out by wars, unrest, and development in the region. There are programs to reintroduce them now! One thing as a kid that got me into the animal stuff is, in Eilat, which is on the Red Sea, there are AMAZING coral reefs. Amazing. There was a pier that you could walk out on, into the sea, and there was a way to go underwater and see viewing areas of the coral reef. That also got me in love with the natural world and with animals. Also, near the kibbutz where I was raised, there was a wildlife refuge with ostriches, ibexes, things like that, which you could see while driving on the road. What do you guys hope to learn from this project? Adar: Well for me, this is my first time going through the process of independently doing a research project and writing a paper. I’ve done that once for a class, but this is my first experience doing real world scientific research. I hope to get a feel for it and see if I like it. Taylor: Most of my research back at my home institution focuses on genetics, so I wanted to see the behavioral side of things. I’m applying to PhD programs this fall, so I think it’s important to figure that out what I like doing before I start the process. You’re going straight from undergrad to a PhD? Taylor: Yes, I’m a McNair Scholar so it’s what they push us to do. On top of that, the SURF program has us apply straight to PhD programs at the University of Florida as well, so I’m figuring out what I want to do!